The Tharaka people are working for the protection and revival of Kathita River, that streams through their communities and is a critical source of water for them. Eco-cultural mapping has been an important tool for them to revive, document and mobilise their indigenous knowledge to create concerted actions with all the actors along the river. Their research process has been part of the piloting of the Multiple Evidence Base approach. 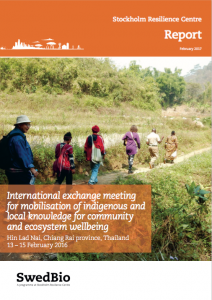 Four reports present experiences from indigenous communities in Ethiopia, Kenya, the Philippines and Thailand piloting a Multiple Evidence Base (MEB) approach. Whilst each experience is unique, what all of the community research processes have in common is that they are based on the communities’ own identified needs, priorities and methods. Biodiversity, food and culture are the unifying topics. 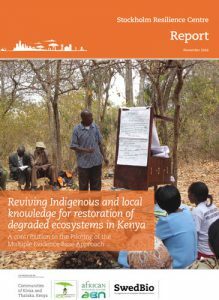 Communities engaged in the MEB piloting to reach objectives including the recovery of lost seeds, protection and revitalisation of sacred natural sites and the rituals connected to them, as well as the need to rehabilitate eroded landscapes by combining traditional knowledge with new methods. 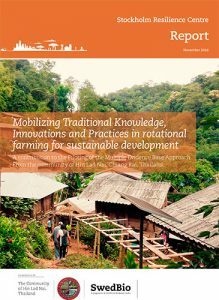 Another aim is to mobilise knowledge as part of efforts to demonstrate the sustainability of their management practices and governance systems, as a way of creating an evidence base for policies. For all the communities, mobilisation and revival of their own indigenous and local knowledge and practices are part of securing territory, authority and rights to govern their ecosystems in a sustainable way. The outcomes have been well received by local and regional authorities and resulted in improved collaboration in responding to identified challenges. The communities engaged in methods and approaches that were well suited to the local context, such as eco-cultural mapping and intergenerational learning, and embraced cultural and spiritual dimensions. How knowledge is revived and mobilised has proved to be an important part of building confidence before interactions with other knowledge systems, including authorities, to co-generate new knowledge based on identified needs. 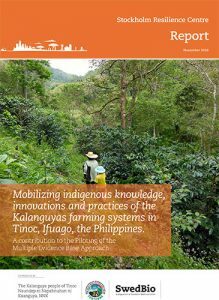 The reports build on the collaborative partnership that has emerged from an ongoing dialogue across knowledge systems, involving SwedBio and partners among indigenous peoples, local community organisations and networks of experts from different knowledge systems. All participants are committed to valuing diversity and are engaged in biodiversity management and its links to policy processes from local to global, such as in the Conventions on Biological Diversity (CBD) and the Intergovernmental Panel for Biodiversity and Ecosystem Services (IPBES). The starting point was the window of opportunity emerging from the possible inclusion of indigenous and local knowledge in IPBES, during the years before IPBES was established. (See for example the Guna Yala dialogue, held back to back with the founding plenary of the IPBES). One of the outcomes of the ongoing dialogue has been the envisioning of The Multiple Evidence Base (MEB). The MEB approach emphasises the importance of equitable and transparent processes for mobilising knowledge while bridging across knowledge systems, and of maintaining the integrity of each knowledge system throughout the process. This means that evaluations of knowledge occur within, rather than across, the contributing knowledge systems when mobilising and synthesising knowledge, for example, in an ecosystem assessment process. In this way, the community research processes have been part of piloting a Multiple Evidence Base approach for collaboration across knowledge systems, based on equity, reciprocity and usefulness for all involved. 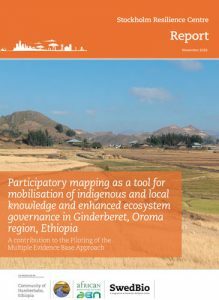 One of the objectives of the piloting of MEB has been to develop methods, procedures and good examples for how evidence can be mobilised for multiple needs, at local to global levels, and across knowledge systems. For example, knowledge that is relevant for feeding into local and national policymaking, as well as in processes such as assessments for the CBD and the IPBES, and other fora where working with synergies across knowledge systems are essential. Additional objectives have included: contributing to changing the views that governments hold about indigenous governance and management systems, towards respect and benefit for indigenous peoples and local communities; strengthening livelihoods and well-being within the communities, based on their indigenous governance systems, and finally, promoting joint learning around this across the participating communities and other partners. SwedBio at Stockholm Resilience Centre, Sweden.